Gone are the days of baggy, unshapely athletic wear for women. Yet, when the founders of Iladora, Ilana Siegelman and Meghan Murphy, set out to find themselves a flattering pair of bike pants for riding to and from work, they came up empty handed. So, the two California girls took matters into their own hands. Made in San Francisco, these bike commuter pants are designed especially for riding. Featuring all-weather fabric, the ideal amount of stretch, and strategically-placed seams in all the right places, the Perfect Bike Pant by Iladora even includes a magnetic cuff roll to protect against chain grease and a hidden zipper side pocket for on-the-go essentials. Durable enough for your daily commute, yet sleek enough to wear around the office, these pants can take you from workout to work and back again. Hello Grommeteers! 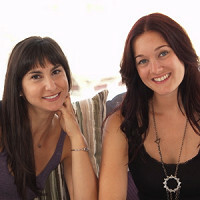 We’re so excited to meet you and share our love of biking and fashion. When we started Iladora Apparel we had one main challenge to solve: how can we design clothing that can withstand daily bike commutes without compromising style? We needed clothing that can handle a short ride around town without having to go full spandex. Now we have a line of apparel that combines performance and classic style with the female city biker in mind. Designed and made in San Francisco with eco-friendly fabrics, let us know what you think. I was one of the testers for the Iladora pants. I started out impressed with the fit and comfort and I was a bit surprised at that because I thought they would not conform to my rather straight up and down shape. I knew they were great for curvier types but they fit me beautifully too. My first test was a 14 mile bike ride. Check. Then I did a few hikes. Check. Then I washed them. Check. But the ultimate endorsement I can give them is that I brought them for a trip to Japan. I pack very light so every piece needs to really merit the space. I needed to cover long flights, business meetings, and sports and they were the only solution I have ever found for that extreme span of activities. They don't get all stretched out and they repel stains to stay looking fresh even under that extreme set of wearings (think spilled coffee/food on the flight, public transportation, sleeping in them, meetings, hiking, and then flying home again). One funky thing is that the snap to secure the pant leg up away from the bike chain set off the metal detector in the airport security. It was not a big deal but I was surprised and had to figure out what was going on. Just be forewarned. @Jules This is the first time we've heard your review - thank you for testing and sharing. So glad you enjoyed them from your bike ride to travel around the world. Great tip on the airport security, something we will add to our product description :) Thank you Jules! Well hopefully you 2 won't discriminate and will come up with the perfect cycling pants for men as well!!! @Thom We may one day expand to men's apparel but we're focused on women at this time. There's actually more options in the market for men when it comes to commuter, durable fashion. We're looking to provide the same options for women. Stay tuned! @Meghan It may seem like there's a lot out there for men. But not that fits my needs or even fits my fit! If you have found the equivalent of this for men, I'd love to see a link. In the end though, wool is where it's at with me. In general, synthetics need to be washed after every use. Wool allows me to hang and reuse for a week or more. But again... no real availability of quality wool knicks with real pockets for under $400. Gone are the days of baggy, unshapely athletic wear for women. Yet, when the founders of Iladora, Ilana Siegelman and Meghan Murphy, set out to find themselves a flattering pair of bike pants for riding to and from work, they came up empty handed. So, the two California girls took matters into their own hands. 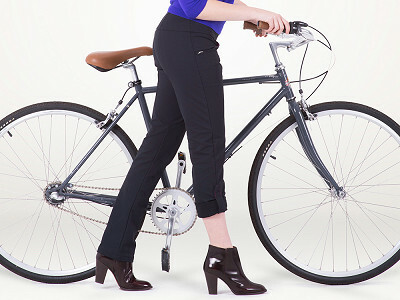 Made in San Francisco, these bike commuter pants are designed especially for riding. Featuring all-weather fabric, the ideal amount of stretch, and strategically-placed seams in all the right places, the Perfect Bike Pant by Iladora even includes a magnetic cuff roll to protect against chain grease and a hidden zipper side pocket for on-the-go essentials.